The house No. 5 Hydro Cottage, was built by the Hydro Electric Company in 1959-61, as the other Hydro Cottages Nos. 3-8. Cottage No. 5 actually forms a third of this group of six dwellings, built at this time as a single composition. 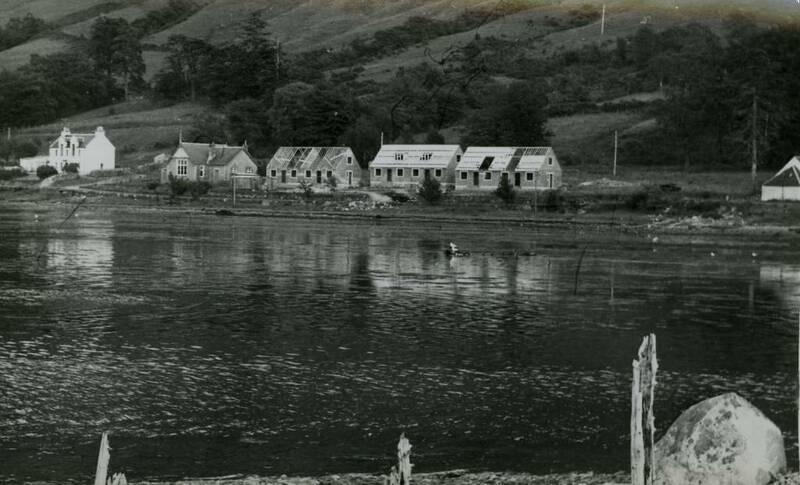 This composition consisted of three double cottages that face on to the loch side which is identified here as north facing, thus the principal elevation is to the north. 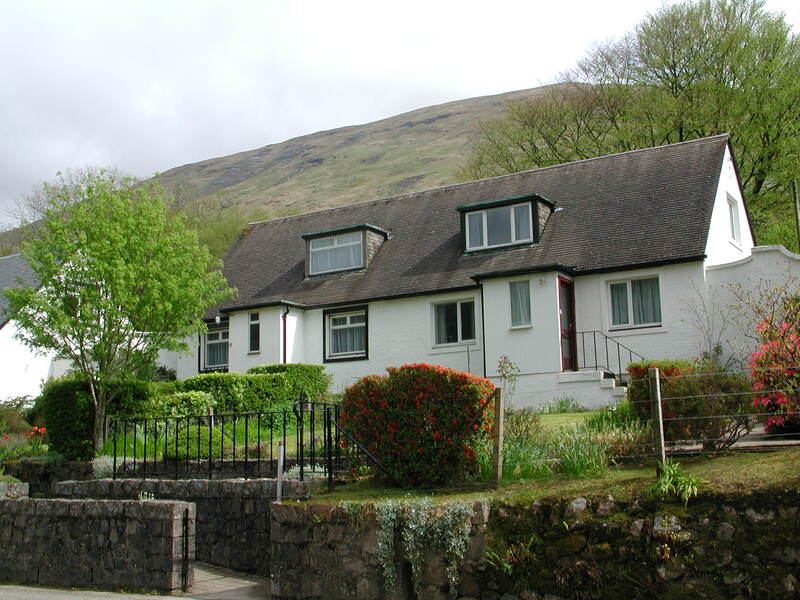 The cottages are located on the moderately to steeply rising ground above the Cairndow village street on the south side of the loch and the south side of this street. Clearly, the composition was built on a green field site. This had been bounded on the roadside by a stone-and-lime-built wall that still exists except where it has been broken through in the centre point to form a series of stone-and-cement-built walls and ramps. Within this opening, these give access to the various parts of the cottage complex. Each of the three double cottages consists of an east / west aligned range, which is built under a double pitched slated roof. Of these slated roofs the two outer paired cottages still retain their slates, while the central one has been re-roofed with concrete tiles. The three double cottages are linked to each other by small flanking walls on either side of the central one. These consist of short quadrant curves and then straight sections angling to the outer cottages within the straight sections. Within each of the straight sections there is a plain entrance. The wallhead of these little flanking walls have shapes detailing, formed by a cement cope. The cottages and flanking walls are all harled in cement and painted white, apparently built of cement blockwork. The cottages themselves are raised on a relatively high plinth and each of the cottages is reached on its principal frontage by a short flight of six concrete steps. They rise up with a wrought iron handrail. A short platform at the end of each stair leads into a boarded, wooden entrance porch or vestibule. To the rear of each cottage is a very slight terracing back to the hillside at slab level and the small sunken area behind has a cast concrete walkway running round it. Thus rather than being terraced back into the hillsides they are built up on platforms. Each cottage is of tri-partite form on the principal elevation with the porch concealing the principal entrance and a window on either side of this. The window surrounds with detailed and raised margins are formed of cementwork. The central pair of cottages is somewhat set back between the pairs on either side. Each cottage is detailed on the north side with a dormer window that is comparatively broad. This is copper roofed and slate sided. On the principal frontage the lower part of the plinth of each cottage is harled over. There is a plain string course which appears to correspond to the floor slab level. Above this the walling is then harled again, up to the apex. Each of the cottages is detailed with eaves boarding and gutter boarding that are fairly insubstantial and without any moulded detail. All of these are painted black. Of all of the windows within the cottages no originals appear now to survive. The existing ones have successively been superseded, the earlier ones apparently from 1983 onwards. Each cottage has one gable wall within it and within these, each has an external entrance to the back areas. These entrances are detailed with a raised margin formed in cementwork around the entrance itself. Two or three cementwork or concrete steps usually rise up to the side entrance. Flanking each entrance on its north side is a small entrance vestibule window. The rear south wall of each cottage contains two broad windows at ground floor level, again with the raised margins, painted black etc. The description of No. 5 serves as a representative sample of the six cottages overall. The building overall is built of brickwork, 9" red bricks, some of which are still visible within the kitchen. Rising up to the principal entrance on the north front, the small entrance vestibule or porch, had been boarded originally. Most of these features have been almost entirely renewed. The porch area gives access in to the principal entrance into the house itself. The cottage interior is entered through an inner door, which in the case of No. 5 is the original one surviving. This door is framed with three horizontally arranged glass panes occupying most of its area. This leads into a small vestibule area at the foot of a straight stair that rises directly up to the south. There is an entrance to the east, giving access into what had been a small box bedroom. The door to this is not present now and the opening is simply appointed within. The room has skirtings with a deeply chamfered top. At the west end of the south wall there is a narrow entrance to a former press which has now been re-lined out. The door to this is now missing. The architraves around the entrances are all simply detailed with rounded arisses. The stairwell was originally partly open on its west side, to face into the main living room. At the north end of this wall section the remains of a pine post survive. The intervening space between the post is now open but as apparently typical with all of these six cottages there had been vertical spars of two by one, about twelve, each infilling a space. The arrangement thus allows a degree of an open plan interior visible into the stairwell area from the living room. The living room occupies the whole of the western half of the ground floor with broad windows to front and back. The walls are simply lined out without cornice; the skirting is with chamfered tops throughout. The wall lining is early plasterboard, paper backed plasterboard on to 0.5" by 1" battens. These are fixed directly to the brickwork behind. At the south end of the east wall of the living room is an entrance which gives access into the kitchen. The ceiling of the living room is without detail, the only feature being an east/west boxing, apparently suggesting the position of a beam or structural element but apparently there is no such structural element within the boxing, so apparently a semi-decorative feature. Within the living room there is a small understair cupboard. The kitchen now occupies all of the south-east part of the ground floor of the house, but originally there had been sub-divisions. In the east wall the existing external entrance gave into a small vestibule area and from this vestibule area on the south side was an entrance into what had been a long galley-type kitchen with units running all the way along the south wall. The east end of the galley kitchen was partitioned off and here was a walk-in larder with a single entrance. Within the entrance vestibule, as you walked in from the exterior, facing you to the west, was a further small entrance leading into a large storage room with a door. All of these internal partitions have now been removed and the space formed into one larger kitchen, this lined throughout with new units on the north side, the south side and the east side. On the line of the main east/west aligned partition, that was taken out, a new beam was inserted, a principal joist of pine with deep rectangular section. The straight flight of stairs rises up to a small stair landing, from which there are entrances to either side to east and west and one straight ahead to the south, the latter giving in to a bathroom. The first floor is lit by a dormer window of somewhat curious detail. This has a flat copper roof and slated sides and an apron running down to eaves level, below the window on the south side, which is slated. None of these rear windows contain their original fenestration. The bathroom occupies the width of the rear dormer and originally had had a bath along the east wall. The room now retains its original sink which is a ceramic pedestal sink, (Maker's name “Coral” and underneath it says, “Wm B Morrison & Son Ltd Glasgow”). The shower and existing toilet are recent. The bathroom is vinyl floored and white-painted throughout. The principal bedroom is to the west from this stair landing. This is well coombed to the north and south, lit by a broad dormer window to the north, with elevated view over Loch Fyne. To the south the coombing is largely occupied by fitted wardrobes on either side of an integral chest of drawers, this with five drawers with narrow rectangular handles, all of which relate to the 1959-61 construction period and is in excellent condition. The wardrobe linen press drawers are the original. These are plain, of ply construction, as are the doors generally. Architraves around this, as in all the other entrances, are of plain detail with narrow rounded arrisses. The second bedroom which is eastwards off the stair landing is similarly appointed, the principal difference being the window in the gable wall here to the east. The ceiling is coombed to the north and south with the coombing to the south again occupied by fitted units, in this case a single wardrobe and similar chest of drawers, all fully integral. Originally the linings had no insulation other than on the vertical. Walls are half inch glass fibre and then at collar level four inches of wool dust above the ceiling. On the north side of the room to the northwest is a small access door to the area behind the coombing. In the western bedroom there is an access hatch up into the loft space above. This is in the centre of the east part of the room.